Are looking for that perfect suit that you can wear for that very special interview? Perhaps you need something that will really look good on you for a conference of a special meeting. A business suit is something that you can look up to. These type of suits are recognized by their perfect business attire that will make you look professional and elegant. Therefore, business suits are known as emblems of professional identity and official power, giving the suggestion of a life which is free from any type of physical toil. There are different types of business suits available today. Among them are single-breasted suits, double-breasted suits, Can be a two-piece or a three-piece suit, as well as other fit types such as British suits, Italian suits, and American suits. It is very important to select the appropriate suit for the occasion that you are preparing for. After all, the business suit that you need to choose will depend on the specific type of event that you are planning on wearing it. For example, for a job interview, a suit that is single breasted and a two-piece suit is a good choice. On the other hand, a double-breasted three-piece black business suit is perfect for a power meeting. 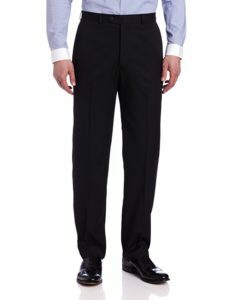 This modern style business suit is made of polyester and rayon. The two-button suit jacket features notched lapel, hacking flap pockets at its sides, four-button cuffs and side vents. Most of the people who own this suit are satisfied with it. More than 70% rated it as perfect. It gives you a body room even if you aren’t an athletic type of person. Good for job interviews, business meetings, dinner parties and other formal occasions. It fits great. Complete the set with the Kenneth Cole Reaction Pants. Made from the same material. Featuring a flat-front silhouette and slant pockets, with a zip-button closure and hemmed bottom. These pants should be at least twice the price. They look and feel like top class pants. 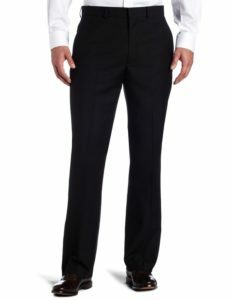 This business suit from Haggar is made of polyester with viscose rayon. It is a two-button suit coat which features a notched collar, four-button sleeves and a center back vent. It has flap pockets on the side and a single chest pocket. Since the material used is medium-light weight, it is not too heavy. Perfect for moving comfortably for work and business use. This means that it is not too warm for summer wear as well, but not thick enough to give you warmth for the cold. Once you wear it, you can sense that high-quality workmanship. You will definitely love it! This product is especially made by hand, using only high-quality and natural materials. This business suit is available for product customization without any extra charge, via Amazon. The package comes with pants, clothes and vest. Perfect for office and other business meetings. This business suit is made of polyester and rayon wool touch feel fabric. This single breasted side vent jacket comes with a classic fit, with 2-buttons and notched lapel. Available in various colors, including: black, grey, brown, navy, burgundy, charcoal etc. Perfect for office work and dinner events. This business suit is perfect for an all year round use, making it a great investment to be added in your closet. It comes as a vested modern fit men’s suit. It consists of single-breasted, two buttons, dual side vent jacket; and flat front pants (matched by 6-inch drop). It is really fashionable with its modern fitted cut and looks. Available in different colors, such as black, blue, charcoal etc. Perfect for business meetings and official events. 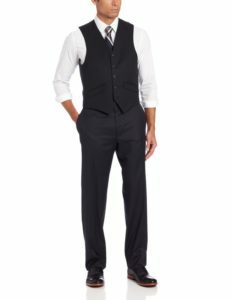 In addition, the suit includes a 5-button matching colored vest that comes with three outside pockets with an adjustable back. This three-piece suit is certainly perfect for an all year round use, making it a great investment added right into your closet. Different types of business suits may be found at most specialized stores and other online sources, including Amazon. There is a wide range of choices that you can choose from, including the options presented above. They come in different types of materials, construction and colors, with several other unique features. There are different types of business suits that you can take into consideration adding to your personal wardrobe. Among the items included in the list, the business suit from Kenneth Cole is a recommended option for most of the modern businessmen these days. It comes with features that are highly comfortable, elegant to look at, and completely reasonable when it comes to price. Most reviews are positive, saying that this business suit is a bargain for the price. Contours great to the body shape. Arrives in great packing and on a proper suit hanger. Perfect for any business use. 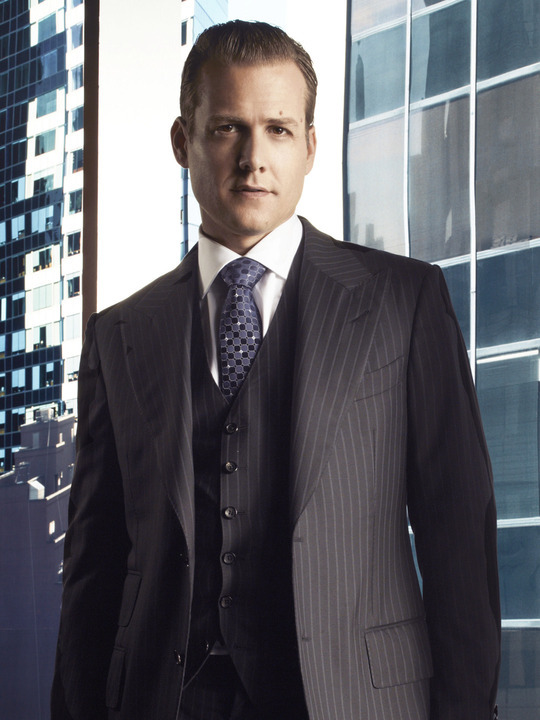 Vinci’s double-breasted suit is another powerful business suit option. It’s definitely a dress-to-kill choice. The power and determination it brings can’t go unnoticed. The fit and style are perfect for important business meetings and events. The workmanship is also of high quality, you will love it!